Our president's day of fun and amusement in Parliament; Turkey's Erdogan, a global leader; Biko memorial lecture; desperately seeking Julius, as discplinary hearing becomes drawn-out affair; and is Novak Djokovic the best tennis player ever? By TEAM iMAVERICK. Yet another rumour had it that the elderly Nelson Mandela had died, but thanks to Twitter the gossip died quickly. It apparently followed news that Winnie Madikizela-Mandela had been admitted to hospital. CARIEN DU PLESSIS reports. 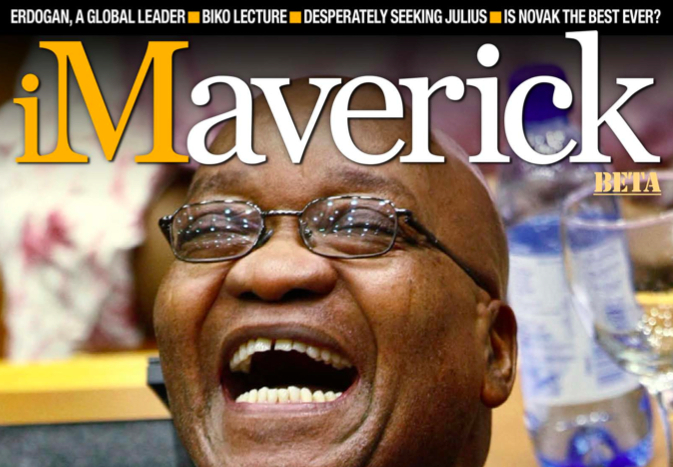 President Jacob Zuma was all giggles in the National Assembly on Tuesday when he appeared to answer members’ questions. The President at times laughed before and after his responses. He even laughed while some members were posing their questions. Sometimes, Zuma was the only one in the room laughing, prompting OSIAME MOLEFE to ask the obvious question. The Julius Malema Disciplinary Hearings (the capitals are deliberate) have gone from the planned “twenty- twenty bang-bang, you’re out” affairs they were supposed to be to a Wagnerian five-day saga. In other words, it’s going to take a long time. The eventual length of these proceedings will have implications for all the political figures involved. And possibly for the outcome as well. By STEPHEN GROOTES. Few people are better suited to give UCT’s annual Steve Biko Memorial Lecture than Sydney Kentridge, who represented Steve Biko’s family at the inquest into his death. And his performance last night vindicated the choice: a masterclass in appropriate commemoration, interspersed with some earnest warnings as to South Africa’s judicial path. By REBECCA DAVIS. A Port Elizabeth seamstress living in a poverty stricken squatter camp in KwaNoxolo in the Eastern Cape city speaks out about the years of suffering she’s had to endure after trading sexual favours to a Home Affairs official in order to get an ID document she hoped would enable a better life. By MANDY DE WAAL. Whether true or not, the legend of the apple falling on Isaac Newton’s head and leading to his theories about gravity (obviously over-simplified here), demonstrates the truism that great ideas can spring from the unlikeliest of places. That’s why, no matter how ill-considered, asinine, trite or plain dumb, readers’ comments always have the potential for value – note “potential” – even if not expressed in modern Facebook-style “likes/dislikes”. 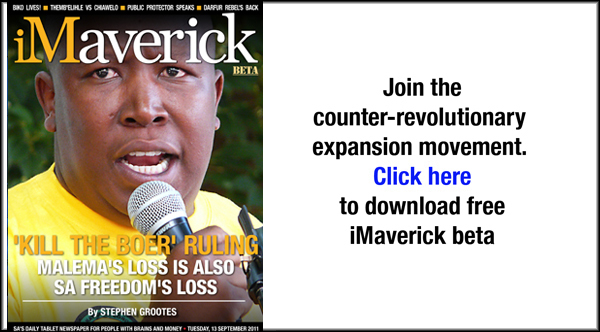 AfriForum’s decision to take ANC Youth League leader Julius Malema to the Equality Court could have done more damage than good to those who define themselves as ‘boers’. It’s time for the to kill the ‘boer mindset’, and embrace the future. The success of Chinese companies in Africa has little to do with their cost effectiveness, meeting deadlines or ultimate quality. Reminiscent of dubious US-led funding projects in Central American countries in the last century, Chinese expansion in Africa has everything to do with the funding guarantees they bring – as a new deal in Kenya demonstrates. By SIMON ALLISON. The horrific pipeline explosion which killed more than 100 people in one of Nairobi’s poorest areas wasn’t directly caused by the government, but is widely seen as the result of a political system more concerned with tax evasion than with providing basic services and lifting people out of poverty. By SIMON ALLISON. After months of violence, President Goodluck Jonathan’s given his army a blank cheque to sort out the problem city of Jos. Citizens of Jos, be afraid. The Nigerian army doesn’t have a stellar record of conflict resolution, preferring their justice rough and their executions summary. By SIMON ALLISON. The battle for Afghanistan continued on Tuesday as a multi-pronged attack by Taliban militants sowed chaos and confusion in the capital Kabul. A stand-off between heavily armed militants and Afghan forces lasted 19-hours. It was only early on Wednesday that the Afghan government confirmed that the siege had finally ended as the last remaining militants were killed. While the latest attack raises fresh doubts about the readiness of Afghan forces to assume control of the country when Nato withdraws, the staggering loss of life in this war has become a side-show to the political playmaking. By KHADIJA PATEL. The Turkish Prime Minister is on a tour of the revolutionary parts of North Africa. As he struts his way through his itinerary with stops in Egypt, Tunisia and Libya, he carries a new mantle as global Muslim leader. By KHADIJA PATEL. Iranian President Mahmoud Ahmadinejad has announced that the two American hikers, sentenced just last month to eight years in prison, will be released in a “humanitarian gesture”. Why now? Ahmadinejad’s address to the UN in New York next week may just have something to do with it. Not to mention attempts to reopen nuclear negotiations with the West. By THERESA MALLINSON. It’s been a short reprieve for former IMF head Dominique Strauss-Kahn. On Monday, only days after arriving back in his homeland of France, he was on the receiving end of three hours of questioning relating to another sexual assault case. By REBECCA DAVIS. The UN refugee agency announced on Tuesday that its annual Nansen Refugee Award will honour Yemen-based NGO the Society for Humanitarian Solidarity for its work with refugees and migrants who make the treacherous sea journey to Yemen from the embattled Horn of Africa region. By KHADIJA PATEL. Torrential rains have lashed the Indian sub-continent leaving thousands displaced in India, but Pakistan has once again been left gasping desperately for help as millions of displaced people are stranded without food. By KHADIJA PATEL. Anointed by the newest polling data, Republican front-runner Rick Perry was in the crosshairs of all of the other participants in the most recent debate over who will challenge Barack Obama come November 2012. By J BROOKS SPECTOR. Would you subscribe to an online library? Amazon thinks you would. Some say that they are planning to launch a rental bookstore for ebooks in the Netflix mould. Amazon themselves don’t appear to be terribly bullish about the idea – their ebook library will only be available to a few. By SIPHO HLONGWANE. People will take liberties when they think stuff is for free, won’t they. Vodacom has decided to clamp down on the most excessive users of the Blackberry Internet Service. By SIPHO HLONGWANE. It’s a ridiculously simple game that has made its way into hundreds of millions of mobile devices around the world. Its wild success took its creators by surprise, but they are responding now. If you’ve never heard of Angry Birds, the Star Wars of mobile gaming, now would be a good time to get acquainted. By SIPHO HLONGWANE. WILL IT EVER BE APPROPRIATE TO TELL 9/11 JOKES? Is it too soon to tell jokes about 9/11? British comedian Jimmy Carr received an answer to that question in the way of an overwhelming “yes” when he risked a relatively mild September 11 gag last weekend. By REBECCA DAVIS. In this crazy, strife-torn world there is one global event which gives us an opportunity to come together and stand shoulder-to-shoulder in shared humanity. For a few glittering hours on an evening of pageant, we remember what really matters: deciding who is the hottest 18- to 27-year-old woman in the Universe. By REBECCA DAVIS. Jermaine Defoe is relieved Luka Modric is still a Tottenham player, but expects the transfer furore around the midfielder to continue unabated. By Football365.com. South African-born Wallabies’ lock Dan Vickerman is relishing the chance of facing Ireland’s Paul O’Connell in their Pool C clash in Auckland on Saturday. By PlanetRugby.com. DJOKERS WILD: IS NOVAK THE BEST EVER? When David Foster-Wallace wrote his rapturous piece on Roger Federer for The New York Times Magazine, a piece often lauded by people who don’t read sports essays as the best sports essay of all time, Roger Federer was considered by people who don’t watch tennis as the greatest tennis player of all time. Perhaps it’s time for a reappraisal. By RICHARD POPLAK. Jonathan Trott had his first full season in English first-class cricket in 2004, finishing with 1,126 runs and a title medal. A sign of things to come. By PETER MAY.